I don't mind telling you that early in my search to land a new teaching job my interviews were abysmal. Perhaps the reason behind my lackluster skills as a viable candidate had more to do with the fact that I was the first in my family to begin my professional journey with a bachelor's degree and I was not fully prepared for the transition. After all, embarking into a new-found career was a daunting process. I walked into many interviews, feeling hopeful only to be blindsided by a question that I knew I could answer but did not offer an adequate response. Or worse, I left knowing I held back from giving them additional insight into my growth. Baffled, flustered and even teary-eyed, I walked away from multiple interviews after college wishing I was better equipped. I did not understand why I could not present to future colleagues, who were inquiring about my teaching potential that I had the capacity to reach students deeply, collaborate with them seamlessly and I could navigate myself and others through the most difficult situations. 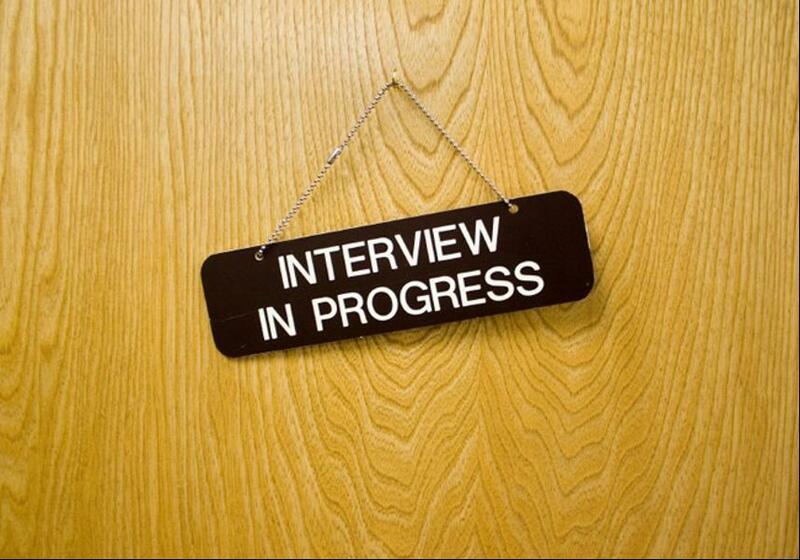 Instead, I would walk out with a smile, internalizing how that was the worst interview ever. Most evenings, I took myself outdoors for a run. It was my time to reflect on the events that had transpired during the day. During my runs, I inquired, "What do I want?" From my interviews, I wanted to offer a portrait of my lived experience. I wanted the opportunity to tell my story and share examples of the passion I had to educate young minds. I wanted future fellow team members to know that I was equally skilled as an educator as I was as a human being, who sought to make meaningful connections. More determined than the last interview, I presented myself with more authenticity. I knew that the same skill set I utilized to earn my degree would be the very skill set that would guide me in my new role as a teacher. I attained another interview. A panel member asked what I could bring to the team. I declared, "I take responsibility for my own actions. I persevere through many challenges along the way. I contribute by offering creative solutions to problems. This is how I attained my degree and can show students how to reach their goals similarly here." How could I possibly forget my first successful interview? It led to my start of my career as an elementary educator. I started working before the contract date required me to begin. I was diligent with the time I spent with those around me. I nurtured relationships and reflected constantly when things went awry. Over time, I built credibility. Five years into my career I was comfortable leading committees or group projects. I not only carried those attributes with me throughout my professional journey but I extended them to students and colleagues who asked for coaching along the way. By 2009-2010 school year, I was in my fourteenth year in the education field. I was the principal of a charter school secondary campus. On our campus we developed student ambassadors, who offered a glimpse into the life of a secondary student. The student ambassadors led tours across our campus. One spring afternoon in 2010, a tour wrapped up and our guests were brought to my office. A representative from Equilibria, a company that developed leaders in the oil and gas industry using cutting-edge tools and processes, along with frontline oil and gas industry leaders and educators from another school district walked into my office to discuss the application of E-Colors and Personal Intervention in a school environment. I was asked, "Would you like to realize potential?" I remarked, "We do that every day. We educate students." However, I knew all too well that even I could benefit from any additional resources to cultivate students. After exploring how the processes shared could improve individual and team productivity and communication, I added, "I did not fair too poorly in my career. However, I can guarantee you that I would have benefited learning the lesson of self awareness sooner rather than later in my life." Applied skills were as critical as soft skills. Developing students to be college and workforce ready was one of the many goals we set as a secondary campus. Students learned the importance of appreciating their strengths, while learning ways to manage potential limiters. Before walking into an interview for an internship, scholarship opportunity or applying for their first job, students were given the opportunity to receive coaching and mentoring from staff. Many students learned how to build a traditional resume. These days, I am not looking for a new career assignment. Most often, the organizations, school districts or universities where I am offering a keynote address or facilitating a session require my resume on file. Nevertheless, I often wondered if potential employers had access to a resume in a way that shared the narrative of the candidate, while offering vulnerable aspects of lived experience would have allowed for more meaningful interviews to take place. The latest version of my resume has transformed since I began my professional career in January 1997. E-Colors, or the process of becoming self aware and Personal Intervention, or the process of managing one's internal pause and play buttons to respond rather than react in any given situation were key to transforming my personal and professional growth and development. 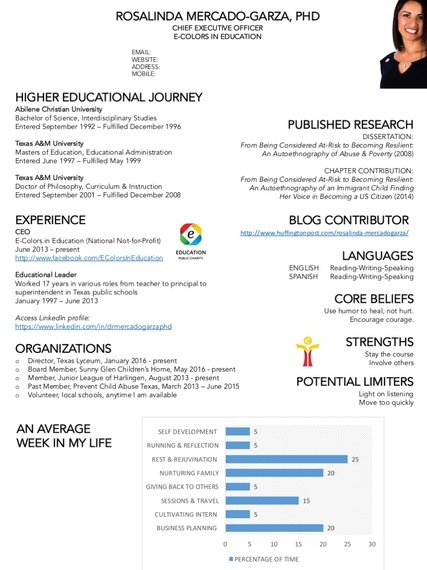 This resume is a portrait of my ever-evolving life experience.